Suziqu's Threadworks: I'm slowly on the way back but just can't make it to the Party! I'm slowly on the way back but just can't make it to the Party! I was so hoping to join in the "Where Bloggers Create"
and these images may convey that. and in my view as a reminder of where my heart lies. Great pictures indead! Hope you recover soon! Stunning pieces from your studio and home,-thank you for also showing my little harth, dearest Suzy. The photoes are all filled with the most beautiful old laces and displays of your wonderful collections .I love every picture, and all you showes us of amazingly created art and old laces ,so gorgeous all! Now you please take care ,and don`t try to do more than your arm can hold!!! I so understand your need for creating, sweetie, but as I also know you tried,and got worce from that, I hope you can wait some more weeks, to be all well !!! Thank you for this beautiful photo trail, I so enjoied it dearest. Dearest Suzy-- we miss you so!! I hope you are continuing to heal-- I know it is a slow process. all that matters is that you get well again right now ~ we all will be here waiting for you! Love all your photos, everything is just so beautiful! Your studio is absolutely a delight to my eyes, heart and soul. I understand your need/want to get back at it, but please take the time your body needs. Missing you! Suzy, I am wishing you a speedy recovery and you really should go ahead and link up. Ready or not, your space is stunning and always an inspiration! Sending more healing thoughts in your direction! Continue to sit in your create space and dream about what you will create when you're feeling well again....dreaming is a good thing. So sorry to hear you are still trying to recover dear Suzy. Hugs and prayers to you. 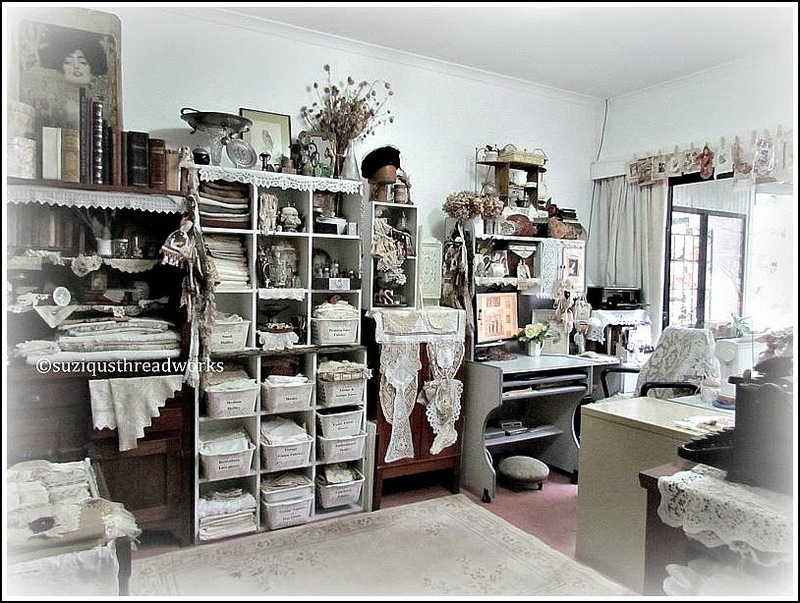 Your trinkets and laces and vignettes are exquisite- what a gorgeous space you have-so inspirational! Oh mercy! Somehow I missed the injury post and hope you're soon on the mend. To be sure, Suzi, your studio gives a lovely life. o dang. yes, I'm hot, tired, not sleeping well and just plain discouraged at life. I am sorry I said "Suzi" and not "Suzy"! You're still loved and missed...please heal quickly! Hi Suzy, your photos are incredible and your space is filled with so much inspiration. I so hope you are feeling better soon so you can spend many a happy hour in this wonderful space again doing what you love. Blessings for better days ahead!! How are you? Do you feel a little bit better? You took wonderful pictures and I love your studio! Suzy what a brilliant studio you have. Everything organized beautifully. All those gorgeous lace pieces and vintage finds. Love it!! Karen. Hello dearest Suzy, Hopefully you'll be fully recovered soon. Your studio is so beautiful and there's inspiration everywhere. As soon as your arm is healed, you'll be back in there and I have no doubts that you'll continue to create gorgeous artwork. Take good care of yourself, sweetie and have a wonderful Sunday! Your body is still telling you that it is not ready, so you are doing the right thing by waiting and listening. There will be plenty of time for stitching and creating, you are already half way there in your mind! Thank you for sharing your beautiful photos! Sending hugs! The pictures are lovely and inspiring. I'm so sorry to hear that you are not so much better and hope you will be recovered very soon. Praying for you. thank you so much for the tour of your beautiful studio.I miss you and hope you will be fully recovered soon. These pictures are beautiful. It's good to hear that you are feeling better. But please have patience for a little time more. Be sure that it is all over. Suzy, what a fabulous space! We may not have seen it all, but what eye candy, oh my! Love the bling, the lace, the vintage lovelies! What can I say, love it all! lol! Wishing you a speedy recovery and back to creating soon! I'm sorry to hear you are still not right. The waiting is frustrating I know! When I broke my hand it seemed to take forever for me to get back to normal. Peeking in to your creative space just makes my mouth water..... you have the best of everything to provide inspiration in your work. Let's hope you will get back there soon. Meantime enjoy your quiet time, developing ideas and stories for future projects. Sending warm wishes, healing hugs and love. Fiquei feliz com sua doce presença! So sorry about your injury, I pray that the recovery is going well and you make a speedy return. Your studio is beautiful and enough to create inspiration for a very long time. Be well. Dear Suzy, it's good to hear that you are feeling better. What a fantastic studio you have ... filled with beautiful treasures. Love all the bling!